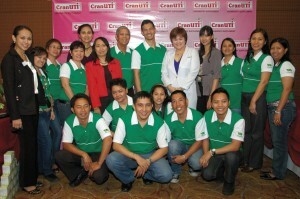 CranUTI Cranberry Supplement successfully presented the first ever UTI FORUM last March 5 at the Crown Regency Hotel in Makati City. Hosted and moderated by Dietitian Ms. Dianne Mendoza, guests from both the medicine and nutrition field namely Doctor Geraldine E. So and Nutritionist-Dietitian Eloisa Villaraza have shared their insights about the causes, complications and alternative solutions to prevent UTI. Also present during the discussion is Dentist Alicia Navarro who herself suffers from UTI very frequently. Her live testimonial about her personal battle with this infection made the activity even more interesting. Co-presented by Whealth Inc., the organizers wish to mount another similar program in the future to continue providing consumer education about the benefits of all natural health and nutrition. With the able support of Walter Bread, Moringana, Blue Cross, ABW Antioxidant Supplements, Business Mirror, People’s Tonight, Total Fitness Magazine, Zen Health Magazine, Generation RX on Studio 23 and UNTV 37, this event was indeed a big success. 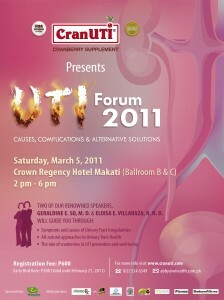 Come and join us on Saturday March 5, 2011 at the Crown Regency Hotel Makati City for the first ever UTI FORUM 2011: Causes, Complications and Alternative Solutions. This lively discussion will cover topics related to urinary tract health and wellness in an entertaining and informative format tailored for busy professionals, concerned mothers and mature women. Registration fee is P600 (includes refreshments and goodie bags) with early bird rate of P500 for registrations made by February 21, 2011. Special discounts for students available upon request. Hosted by one of the Philippines’ foremost health writers and registered nutritionist-dietitian Joan Sumpio, the Forum will present two renowned speakers Geraldine So, M. D. and Eloisa Villaraza, R. N. D. who will share their expertise and knowledge concerning different approaches in UTI prevention and medical nutrition therapy of UTI. 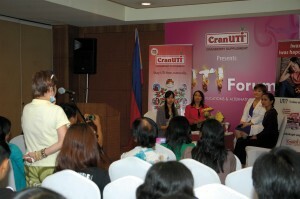 The UTI Forum 2011 is presented by Whealth Inc. and CranUTI Cranberry Supplement, an all-natural alternative to preventing UTI. The event is in partnership with Generation RX on Studio 23, Total Fitness Magazine, Zen Health, Business Mirror and Doc On TV (UNTV 37). The UTI Forum 2011 is part of Whealth Inc.’s mission to provide consumer education about the benefits of all-natural nutrition and healthy lifestyle. To register or for more information, email: abby@whealth.com.ph or call (02) 524 6549 or send SMS to 0922 209 2387, 0919 826 5897. Another common name for cranberry is “bounce berry”. Why “bounce berry”? Ancient stories about this magnificent fruit revealed that a certain New Jersey grower (John Webb) who had wooden legs, had difficulty carrying sacks of cranberries down the stairs. Instead he dropped the cranberries down the stairs and in term noticed that the firmest berries bounced to the bottom but the rotten ones never made it down. But these glossy scarlet red and very tart berries do more than bounce. Cranberries belong to the same Vacciunium genus as the blueberry, and are now popularly touted as having positive benefits in preventing recurrent UTI. Cranberry as a fruit boasts several nutrients. The following chart graphically details the daily nutritional value that a serving of cranberries provide. This is based on the Food Rating System Chart which highlights foods that are especially rich in particular nutrients. Vitamin C and dietary fiber play important roles in immunity and digestion. Though not listed in this table, the following nutrients are also in present in cranberries – calcium, magnesium, phosphorous, potassium, and sugar which are all essential for optimal metabolic health. Cranberries also have an array of phytonutrients or phytochemicals the presence of which has captured the interest of health researchers, in particular proanthocyanidins and flavonoids. Indeed, cranberries possess “tartness” in taste and have strong acidity. It is because of these acidic characteristics that researchers previously believed that cranberry had the potential to prevent UTI. Recent research has shown that it is not only the acidity that is potent in cranberries but also the unusual nature of their antioxidant-enzyme component, proanthocyanidin (PACs), that is related to prevention of UTI. How does this mechanism of action work? The special structure of the PACs act as a barrier to the bacteria that may otherwise latch on the urinary tract. They contain tannins, which are stable phenolic compounds exhibiting potent in vitro anti-adhesion activity against both antibiotic sensitive and resistant strains of Escherichia coli bacteria. This “non-stick”, anti-adhesion activity makes it more difficult for unwanted bacteria like E. coli to cling onto the urinary tract linings. In addition cranberry’s PACs help prevent the proliferation of bacteria that can result in outright infection. The group of individuals who have benefited the most are middle-aged woman who have experienced recurrent UTIs. In some studies, UTIs in this age and gender group have been reduced by more than one third through dietary consumption of cranberry. Cranberries are superb fruit for maintaining UTI health and there are several all-natural products in the market that provide all the macro and micronutrients needed in the daily life processes of the cells and tissues. In addition cranberry supplements can help provide antioxidants that fight the oxidative stress reactions particularly the onset on non-communicable diseases such as obesity, cardiovascular diseases, cancer and hyperlipidemia. Free radicals: Are highly reactive chemicals that rob energy from the normal functioning cells of the body so that they can survive in the body. Maria Eloisa Estipona Villaraza, RND is an independent nutritionist dietitian and private practicing dietitian.